Making Progress on a Two Hour Delay – Can I get a copy of that? Last week on Friday all we had was a $900 pile of lumber. Today, things looked different. Two things came into play to make this happen. First, I had help. Lots of help. 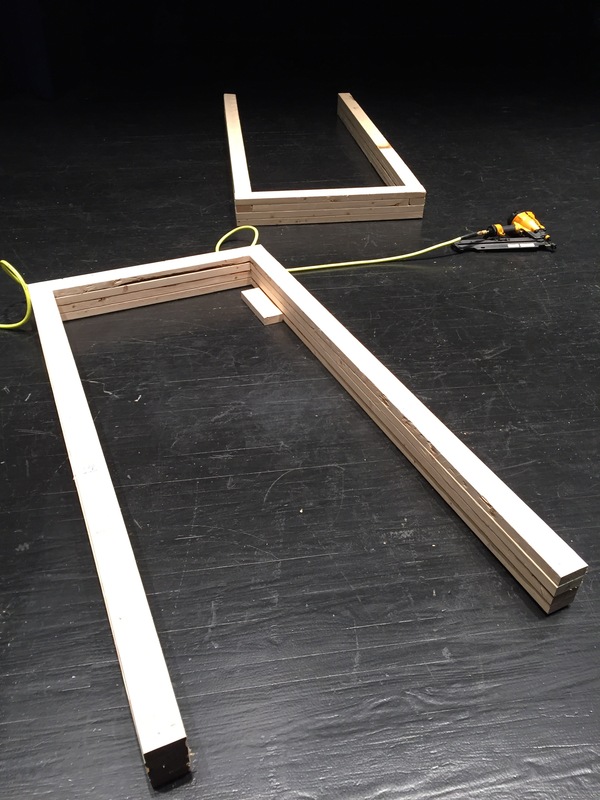 Lured by the promise of learning how to use a high powered pneumatic framing nailer, five former students helped on Monday. They turned out to be pretty bright too. After a quick two minute lesson on laying out 2x4s 16 inch on center, they quickly went to work building wall sections to my prescribed dimensions. In fact, they assembled most of the walls pictured above. Second, we had an unexpected two-hour delay. I was almost to school when I got the call so my hour of build time turned into three. With the extra time, I built these quad stud support members to bear the weight of the 2x10s with half the second story on its back. I also attached the legs (pictured below) to our prebuilt 4×8 platforms. It’s slow work but will provide a sturdy foundations for a landing as the stairs come off the first floor. Screwing legs to a 4×8 platform is anything but glamorous. I also assembled some of the wall sections into something that’s starting to look like the picture. Patrick Nightingale made this WYSIWYG rendering of the set that we’re also working off of as a reference point. Stay tune for more build up dates. Next Working Smarter. Not Harder.